Activities associated with the conduction of industrial safety assessment of design documentation for the construction, expansion, reconstruction, modernization, conservation and liquidation of hazardous production facilities; conduction of industrial safety assessment of technical devices used at hazardous production facilities, buildings and structures on a hazardous industrial sites and other documents pertaining to the operation of oil-field equipment and major pipeline transport. Activities associated with the conduction of industrial safety assessment of design documentation for the construction, expansion, reconstruction, modernization, conservation and liquidation of hazardous production facilities; conduction of industrial safety assessment of technical devices used at hazardous production facilities, buildings and structures on a hazardous industrial sites and other documents pertaining to the associated with the development, storage, use and testing of industrial explosives. This Certificate states that Special Industrial Examination, CJSC has been accredited as a Certification Center to certify products for conducting works on certification in the field of petroleum and chemical engineering, geophysical tools. 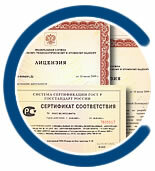 Certificate # ЭО-02340. Special Industrial Examination, CJSC has been accredited as an expert organization in accordance with ISO / IEC 17020:1998 and SDA-11-2009 "Requirements for expert organizations."